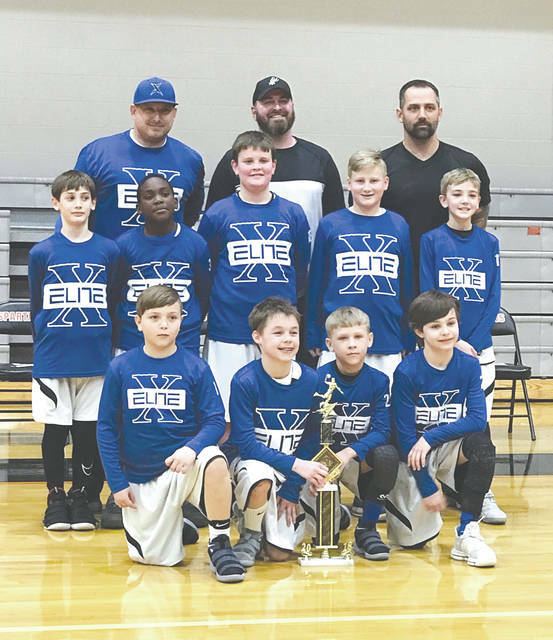 The Xenia Elite fourth-grade boys youth basketball team finished the season with a record of 32-9 of which they went 15-1 in Dayton Metro D3 League play and swept their postseason tournament, 4-0. ​​ Members of the team are: Front row, kneeling — Anthony Butler, Lucas Williams, Laithan Partee, Cameron Salyers; Second Row — Matthew Kingsolver, DeAunte White, Louis Freeman, Cayden Jenkins, Eli Winegarner; Back Row Coaches — Brandon Salyers, Zach Freeman, and Jacob Kingsolver. https://www.fairborndailyherald.com/wp-content/uploads/sites/50/2018/03/web1_XeniaEliteChamps_PS.jpgThe Xenia Elite fourth-grade boys youth basketball team finished the season with a record of 32-9 of which they went 15-1 in Dayton Metro D3 League play and swept their postseason tournament, 4-0. ​​ Members of the team are: Front row, kneeling — Anthony Butler, Lucas Williams, Laithan Partee, Cameron Salyers; Second Row — Matthew Kingsolver, DeAunte White, Louis Freeman, Cayden Jenkins, Eli Winegarner; Back Row Coaches — Brandon Salyers, Zach Freeman, and Jacob Kingsolver. Submitted photo.